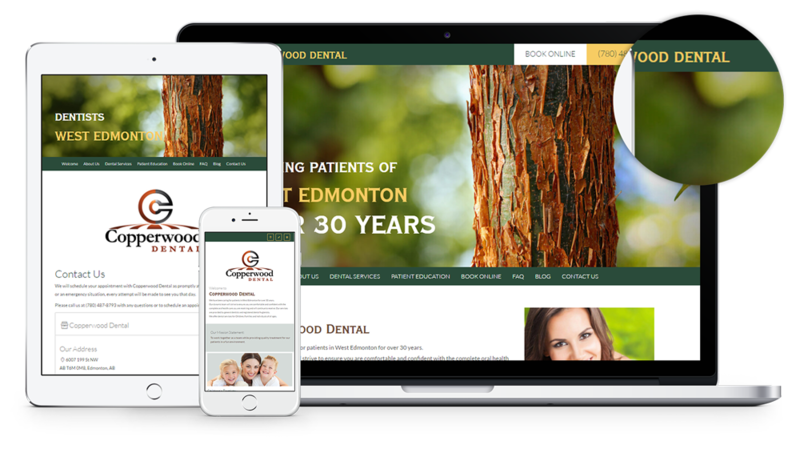 We have just launched a new Website for our client in West Edmonton, Copperwood Dental. We are pleased to announce the launch of a new website for Copperwood Dental! Copperwood Dental has a mission statement to work together as a team while providing quality treatment for their patients in a fun environment. They offer dental services for children, families and individuals of all ages. This is a complete dental website with information on all the dental services they provide so patients can inform themselves. It also has an online form where patients can request for appointments. This feature is very popular amongst dentists and saves them a lot of time. The website is completely responsive designed, so great to view on any screen size, from desktops to cell phones. It has an integrated google map making it easy for patients to get directions to the clinic.